The first challenge in Shadow of the Tomb Raider, Whistle in the Dark, is easy to miss if you’re just excited to be getting into your new game. Trouble is, if you do miss any of the Shadow of the Tomb Raider death whistles, you’re going to need a lot more advice in order to be able to re-access the last one. So here’s how to do it from the start, and what to do if you missed that last one. Don’t panic - we’ve got you covered. 1. Once you learn how to rope pull down doors, you get told how to scramble under obstructions. The first whistle is above you when you emerge. 2. Opposite the door that needs the reinforced knife to open, and to the left of the entrance to the room. 3. Once you’ve made your first rope tether line and climbed it, you can see across the room to the knife’s alter. Look left and you’ll see a hanging cage that you need to climb on. But before you do, look up and left and you’ll see your target hanging there. 4. As you emerge into the water-filled, rectangular chamber on its east side, it’s above you on the right. 5. The last whistle location is in the south-east corner of the room where you clamber across all the bells. One bell swings into the stonework, violently, which can make you miss it. But the whistle is in plain sight just here, just to the right of your straight trajectory across the last two bells. If you do miss this one first time round (which is easily done), you’ll need to go to the Hidden City and complete the Stay of Execution sidequest by talking to Kayara. This eventually gives you the reinforced knife, which allows you to re-access the final chamber in Cozumel. 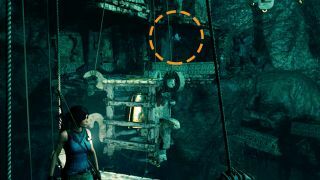 If you're just digging into Lara's latest adventure, why not dig into our extensive Shadow of the Tomb Raider tips?